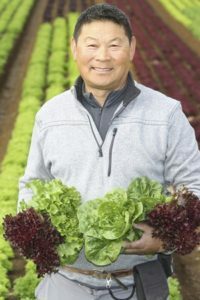 To Auckland market gardener, Allan Fong, fresh thinking is a way of life. Then again, as his business (run with his brother, Colin, and wife Loretta), The Fresh Grower, was established by his grandfather and father, it’s literally been part of the local landscape for decades. This month, we chat with Allan about what it takes to enjoy the sweet taste of success. – Due to Auckland’s housing shortage, there’s some worry that productive land will be rezoned. Has some of our best growing land already been destroyed to make way for new homes? We can’t farm concrete! We hope our land won’t be rezoned as residential but there has been some good growing land in our area [Pukekohe] which has been already. I suppose the carrot is too big. If land is rezoned, the price per acre becomes astronomical. – As the world’s population grows, more food needs to be produced from less land. Are we getting the most out of the land? Are we (in New Zealand) ahead of the game? The world population is increasing at a net rate of 60 million per annum – that’s almost the population of the UK – so the pressure is on! We’re already producing smarter crops, which maximise yield per acre, and changing the way we farm in terms of minimal tillage. I think we are keeping up with the game but environmental pressures – such as better management of nitrogen leeching, water disposal and soil erosion – are huge. We’re well aware of them but commercial farming always comes with some impact, which is unavoidable. There is a trade-off between having affordable food and environmental impact. – While GM (Genetically Modified) crops are not grown here, are there benefits to growing them elsewhere in the world? I don’t think they’re necessary in our environment, in New Zealand. However, in some cases – such as in arid or challenging conditions – there could be some merits in growing GM crops to feed a growing population. – Where is your produce available? Do you plan to keep expanding into markets worldwide? It’s available throughout the North Island, and in the South Island through food cafes, restaurants and the like. About 30 percent of our business is through food services. We’re exporting to Hong Kong – to ourselves, to our own shop – and we’re working on a few projects, looking to export to mainland China as well. – Late last year, you picked up the supreme award at the Australasian Syngenta Growth Awards. What has winning it meant for your business? The awards covered three categories: growth, sustainability and community. We won the supreme award, which was quite a surprise! I think it’ll help make people more aware of our products and what we’re trying to do here. Hopefully, it shows that we’re on the right track. – What’s the secret to The Fresh Grower’s success? Hard work; then again, everyone works hard! It’s probably because we’re bringing niche crops to the mainstream, introducing people to new products, new flavours, new textures and new ways of cooking. – Considering the business has ‘grown’ quite substantially over the years, how much of a hands-on role can you and your brother, Colin, play in the business? Are your children (Ryan and JJ) and nephews (Daniel, Cameron and Matthew) carrying on the family trade? We’re both very hands-on, although the next generation is coming through. Cameron and Matthew are at university while Ryan and Daniel are on the farm. They all want to be involved. Cameron’s studying business, my son’s a chef, Daniel did some horticultural studies and Matthew is studying logistics, so together they cover a lot of bases for the business. My daughter, JJ, is an actress; she helps us out too, though, with our blogs and Facebook and things like that. – Of all the produce the Fresh Grower produces what’s your favourite to eat and why? Our baby cos lettuce or slender stem broccoli. It’s probably because we started with those two when they weren’t available in New Zealand. – If you could be Minister for Primary Industries for one day only, what would you do first and why? I would try and put something in place to incentivise more young people to come into agriculture and horticulture. Food production is essential and, as the population increases, it’s going to be a challenge to feed everyone. Preparing the next generation for this is crucial. – If you could invite any three people to dinner (living or dead) who and why? My dad is long passed now, but I think I’d like to invite him so he could see what we’ve achieved here. Secondly, someone who represents the millennial generation who’s not involved in horticulture. We could then make them more aware of where their food comes from and the effort and energy involved in producing it. Lastly, the UN Secretary General [currently António Guterres] or someone else who can make a real difference by putting their energies into more positive things, rather than wars and disputes. I see so much waste out there on a political level. If they divested their energy away from weapons into research, science and solving the food shortages, wouldn’t the world be a much better place?